The biggest banks in the world are in real trouble. They may have won too much when they won their derivatives bets. At issue is whether these big banks manipulated the LIBOR rate downward, increasing the gap between the floating rate they bet on, and the fixed rate their counterparties bet on to protect against inflation. I have used the following chart many times to show the relationship between the fixed high rate and floating low rates that banks use. When the fixed rate drops below the floating rate the banks are compromised. 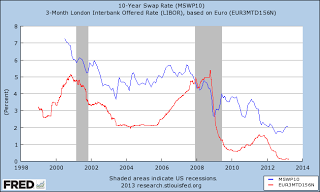 They want the floating rate, designated by the red line, to always float below the blue line. The long simmering LIBOR cases against the big banks may have hit a danger point according to reports by Fortune Magazine and others. Fortune said: on Monday, a judge pushed an anti-trust case against the banks forward, warning that if the case ends up being successful it could be devastating, potentially bankrupting 16 of the 17 largest banks in the world. The following chart that I have used many times, shows the tracking of the fixed rates by the blue line. Tracking the floating rates that the banks took is shown by the red line. If the interest rate tied to the benchmark LIBOR went below 5.6%, then Oakland had to pay Goldman, and if it went above 5.6% Goldman had to pay Oakland. Since then, however, the Federal Reserve has kept interest rates near zero so Goldman had made out like a bandit and Oakland has had to pay through the nose taking money away from teachers, firefighters, policemen and garbage workers and funneling it to Goldman. Now, the banks won on LIBOR bets partly because the Federal Reserve manipulated interest rates which LIBOR mimics and once the blue line went back above the red line, the banks were in a better position to continue to make loans. No one is saying that the Fed was engaging in criminal behavior for manipulating interest rates, although we know it acts as an agent of the banks to save the banks. This is probably the single greatest argument that the Fed must go, must be banished off American soil. And the Fed could have engaged in criminal behavior if it tipped off the banks as to the direction of interest rates. Perhaps the governments and investors who were harmed could look into that someday. But no, the lawsuits focus on the big banks manipulating LIBOR beyond what lower interest rates did. The banks forced LIBOR lower than would otherwise had happened, the lawsuits allege. But the precipitous drop in LIBOR at that point just financially killed the counterparties, some small banks literally died according to Reuters, forcing them to pay way more than they otherwise would have had to pay. Indymac Bank and WaMu were two of those banks. Your state and city governments in Alabama, California and elsewhere suffered enormously. Investors suffered massive losses. The banks named as defendants include Bank of America Corp, Citigroup Inc, Credit Suisse Group AG, Deutsche Bank AG, HSBC Holdings PLC, JPMorgan Chase & Co, and Royal Bank of Scotland Group PLC. Other defendants in the lawsuit are Rabobank, Lloyds Banking Group plc, Societe Generale, Norinchukin Bank, Royal Bank of Canada, Bank of Tokyo-Mitsubishi UFJ and WestLB AG. So, again, to be clear, the Fed lowered interest rates, but banks may have manipulated LIBOR below what would have happened simply with Fed involvement. If it is found those banks are liable for losses to the counterparties, they will have to pay triple damages, and that will put 16 of the 17 largest banks doing business in the United States under. It will bankrupt them if they are forced to pay it all at once. And if they deserve it, what will our "criminal" government then do? What will the Fed and regulators, who should never have allowed the banks to all crowd in to bet on the low floating rate do? What will be done to them? As corrupt as all of this has been, with just pennies paid upon dollars of corruption in other settlements, I figure that the powers that be will not permit all these banks to fail. But if they are spared they should be saved within an inch of their lives, in my opinion. And they should pay monthly, you know, like their borrowers do, for the next decades, to fix this fraud, if it is proven.